The 2019-2020 FIA World Endurance Championship calendar announced today heralds the return of two popular venues, São Paulo and Bahrain, and also introduces a revision to the duration of its different races in line with fan feedback gathered in the 2017 WEC Fan Survey. The eight races, to be run over five continents, continue to offer the WEC’s manufacturers, teams and partners the visibility, marketability and intercontinental spread of prestigious venues in key regions around the world that have been a mark of the championship to date. A significant change in this first stage of the new reverse calendar format, with the 24 Hours of Le Mans being the finale to the season, sees a revision to the length of certain established events. Four, six and eight-hour races will feature ahead of Le Mans in a targeted moved aimed at creating additional interest and growing the motorsport fanbase. The calendar also sees the return of the WEC to popular venues São Paulo and Bahrain, alongside the traditional venues of Fuji, Shanghai, Sebring*, Silverstone and Spa. 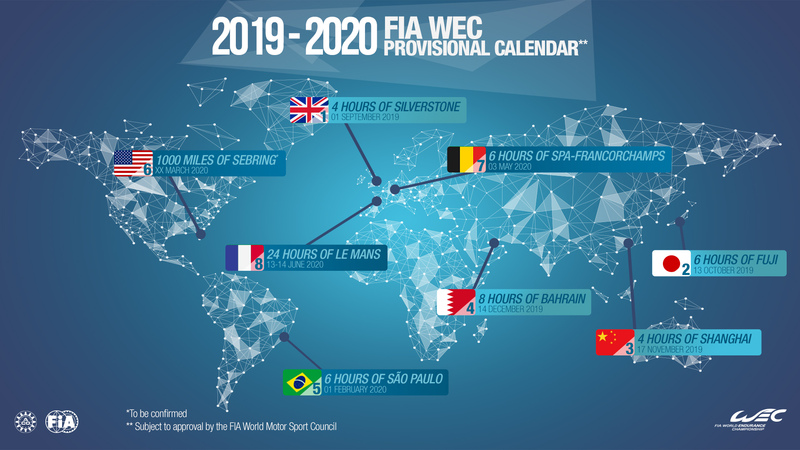 The FIA WEC 2019-2020 calendar will be presented to the FIA Endurance Commission presided over by Richard Mille, and will be submitted to the FIA World Motor Sport Council for approval in Paris on 12th October.